Donald Trump tries to read a book. An epic quest that echoes through time. Photo illustration by Natalie Matthews-Ramo. Photos by Thinksock and Pool/Getty Images. Scene: After a long day of cutting costs for our country, President Donald Trump sits behind his desk in the Oval Office. He heaves a sigh. Finally, he can lose himself in a good book. He’s been anticipating this moment for hours. He picks up the book and looks at it. It feels good to look at a book. It feels good to be the kind of person who sometimes sits behind a big desk and picks up a book and looks at the book. There is writing on the cover of the book. The writing can wait. The president begins to speak. 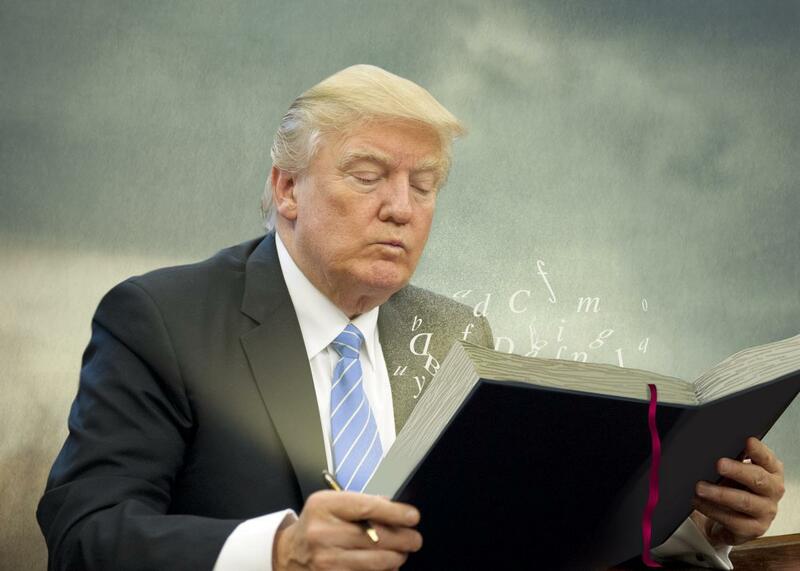 Trump pauses to examine the book. Trump: Andrew Jackson. He was president. I’m also president. Biggest electoral vote margin since Andrew Jackson. Andrew Jackson—some people say he was a bit racist. I’m—well, let me tell you, black people love Trump. We did very, very well with the African Americans. Omarosa. Ben Carson. This book is gonna be tremendous. Here we go. Trump: Could you send that list to Fox and Friends? They’ll read it to me tomorrow morning. Miller: Certainly, Mr. President. Goodnight, Mr. President. Trump hangs up the phone. Trump: OK. That’s OK. It’s just you and me now, Andrew Jackson. Just the two of us. Andrew … Jackson … was … oh my God, it’s happening. It’s really happening. Trump is reading. Look at him go. Go, Trump, go! What an amazing victory. Just outstanding. Trump picks up the phone. Steve Bannon: Sir, the globalist, left-wing media is trying to link your senior aide to Nazi collaborators. We need to fight back. Trump: Robert Pattinson should not take back Kristen Stewart. She cheated on him like a dog and will do it again—just watch. He can do much better! Trump: Wow, the ratings are in, and Arnold Schwarzenegger got “swamped” (or destroyed) by comparison to the ratings machine, DJT. Bannon: Your superior brain has been forged in the purifying flames of generations of Aryan nobility, sir. Trump: Thank you. That’s what Gorka tells me. Now I’m going to tweet that the press is #fakenews. Trump hangs up the phone, then spends the next six hours tweeting. Trump: This is the president. Paul Ryan: Sir, the entire world hates our Trumpcare plan. Conservatives are comparing me to Nancy Pelosi. We’ve alienated both the hard-line budget slashers and the moderates. What do we do? Trump: Paul, we’re in a tight spot, I understand that. Years of conservative rhetoric have convinced the Republican base that Obamacare must be repealed—but at the same time, it benefits a great number of conservative voters, particularly those in rural areas. It’s an object lesson in the consequences of short-term thinking. What we’re going to have to do is revise our bill to maintain coverage in rural, working-class regions while also cutting enough spending to convince the Freedom Caucus that we’re respecting the tenets of small government. It’s possible we’re going to have to look at both means-testing and expanding the provisions of the original bill that bend the long-term cost of Medicare and Medicaid downward by eliminating inefficiency and prioritizing preventive care. Trump: I bet you can relate. Always another crisis, always more costs to keep down. It’s hard to find time for yourself, you know? But the president of the United States should be able to read a book when he wants to. Or at least look at one. Maybe I could just look at this book for a while. Trump peers intently at the book. Trump: Am I doing this right? Trump glares at the book. Trump: I’ll show you, book. Trump falls asleep. He wakes up four hours later. During the night, Steve Bannon has entered the Oval Office and replaced Trump’s book. Trump: The Camp of the Saints. This looks tremendous.